*PDBS stands for Personal Data Backup Strategy. 2 offline full machine backups to external HDDs, one in Hanoi, one in HCMC. I have done this since a few years ago when I was using the ThinkPad T41 laptop (circa 2007). The size of this backup grows linear with time and it is about 300GB these days (with TimeMachine). 1 online backup via Arq to Amazon Glacier for important archival data (how did I flirt with my wife, that kind of serious stuff). Before I started using Arq (early 2013), I made yearly dump of data to DVDs. This backup grows slowly until I met Sylvie and it started to explode, going around 150+ GB now. Mostly full size photos. 1 online backup for work related files are put in Dropbox because their apps (Windows and Mac) work really well. I believe they are the only one who uses delta sync, which is super fast. Since work data changes regularly, it makes sense to use something efficient. My Dropbox account currently using 40GB of data. I haven't paid for it though, got the storage via their various promotional programs. At least 1 alternative online backup for codes. I have many public repos on github.com and just as many private ones on bitbucket.org to keep track of code and they act as secondary backups. 1 online backup for media from cameras, smart phones. I use Dropbox on all of my devices. There are about 30GB of photos currently (of the total 40GB Dropbox data). Their mobile apps work well enough across all platform so it just makes sense. For each device, I also use the respective native backup service (Apple = iCloud, Google = Google+, Microsoft = OneDrive). 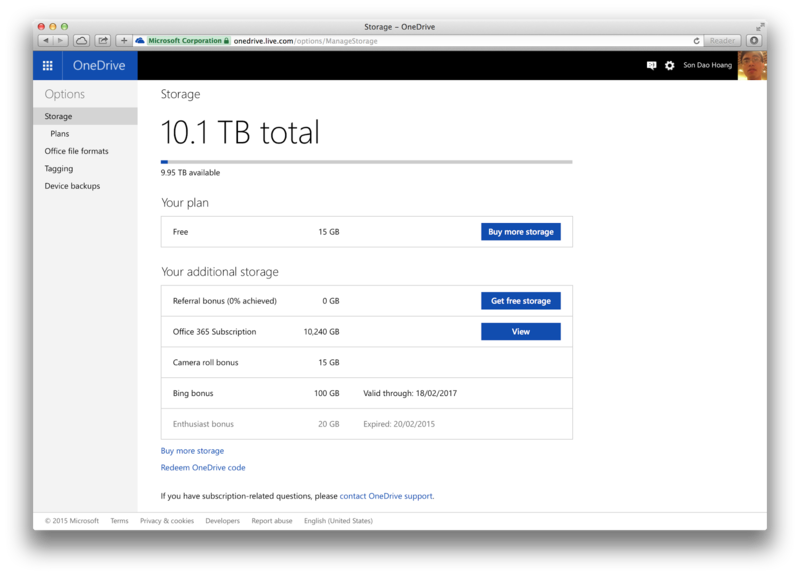 All in all, there has been no problems so far but I made a change recently and moved archival data (150GB) to OneDrive. The simple reason is Microsoft offers 10TB storage for Office 365 subscribers (which I have been for a few years) and OneDrive photo browser is fairly good. Since this collection of data consists 90% of photos, it's great to be able to quickly find a photo when needed. Also, Arq has proven to be quite complicated and slow (probably because I had never upgraded to version 4). Amazon Glacier is cheap and all but downloading data is time consuming and/or expensive. Most of all, there is no way to browse my data online. I started uploading to OneDrive 9 days ago (March 8th) and have just finished today. I still have 9.95 TB available, it's beautiful!